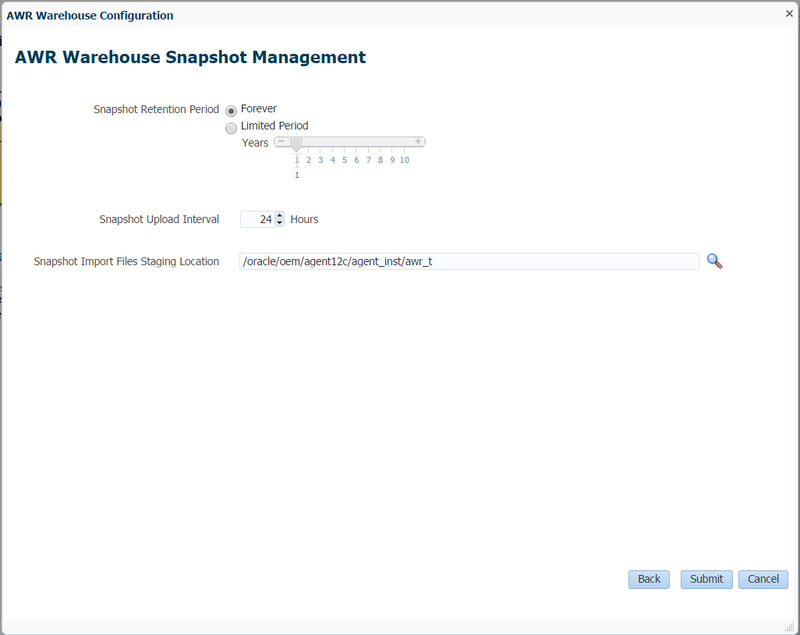 Oracle Enterprise Manager 12cR4 introduces the new “AWR Warehouse (AWRW)” feature, permitting administrators to consolidate AWR statistics from many individual databases managed by OEM into a single AWRW repository database. As with all Oracle features, you must pay attention to licensing here. I will not discuss licensing other than to point you to the relevant documents which you must read and understand yourself: Oracle Database Licensing Information 12c Release 1. 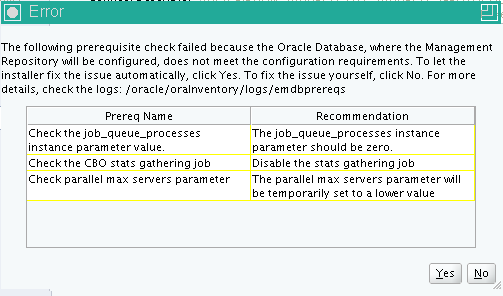 At the moment official documentation appears limited to MOS note 1907335.1 and one section of the Oracle Database 2-Day Database + Performance Tuning Guide. Get familiar with it. You must use Enterprise Edition for the AWRW repository database. You must use version 12.1.0.2 or higher, or version 11.2.0.4 with patch 18547891 applied. Oracle recommends you use a database not used for any other purpose. I strongly agree with that recommendation. Do not use your OEM repository. Note that I had to enable the diagnostic and tuning packs on the AWRW repository database by setting the control_management_pack_access initialization parameter to “DIAG+TUNING” before EM12c would allow me to select it for the repository. 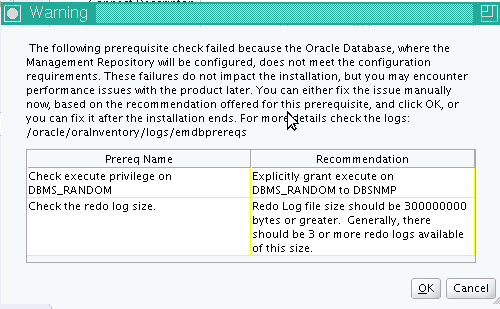 I cannot reiterate enough how much I wish Oracle would explicitly state that users may enable management packs on their limited-use repository databases that support EM12c, RMAN catalogs and AWRW, but only a sucker expects license clarity out of Oracle. I have selected 11.2.0.4 with patch 18547891 for my AWRW repository. 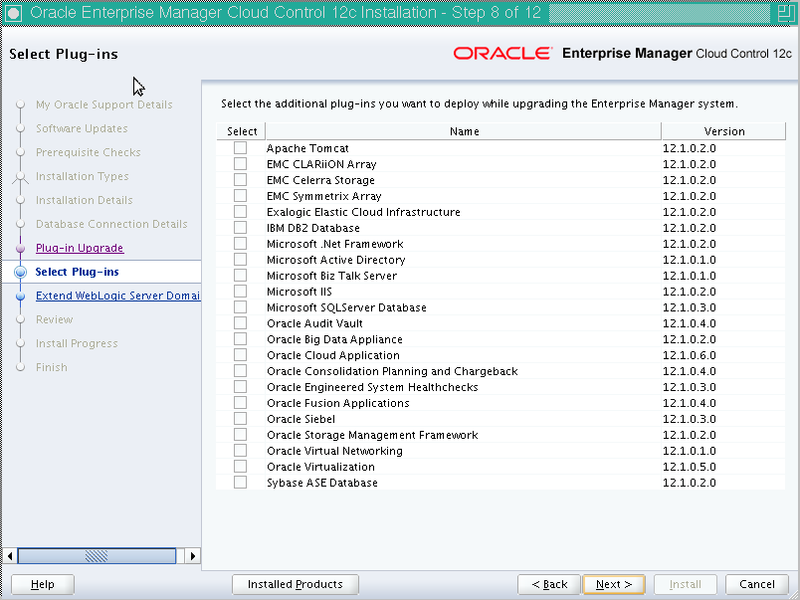 You must use Oracle Enterprise Manager 12cR4 (12.1.0.4), and your OMS must have at least the August 31, 2014 bundle patch (19391521, or a later bundle patch) applied. Your agents must run version 12.1.0.4.2 or later (requiring patch 19051570). Double check your licensing one more time. Do not use features you have not licensed or you will pay a lot of money once you get audited, and you will get audited. For the purposes of this post I will skip the database installation and configuration steps. If you have not yet gained proficiency with base installation and configuration tasks, you should probably gain some experience there before diving in to the AWR Warehouse. 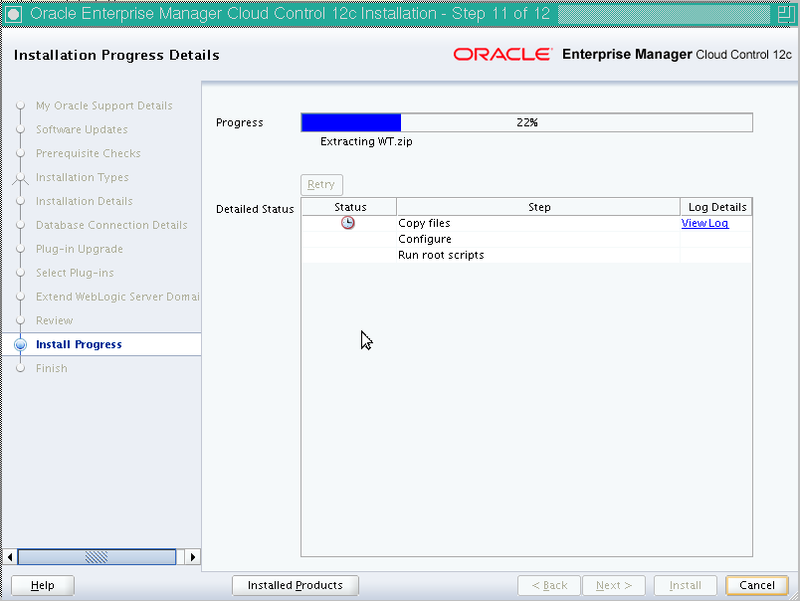 Install a database of the appropriate version and register it with EM12c. Think about your architecture. With the recent release of AWRW functionality, some rough edges still exist. These will probably get cleaned up over the next few releases but they took me by surprise and I have not seen them documented anywhere. Do you use a separate dedicated user account on your servers to run the OEM Agent? I do. Your AGENT_INSTANCE_DIR will get used by AWRW as a place to hold Data Pump output containing each source database’s AWR data. I had to make this directory group writable by the dba group. You also need to make sure the volume where this directory resides has enough free space to hold AWR extracts, which end up quite large on a busy system. You may need to add more space if you keep your agent on a dedicated filesystem, as I do. Do you run multiple instances under isolated accounts that don’t share a group membership? You will probably need to create a group they all share that can write to the AGENT_INSTANCE_DIR. AWRW strongly depends on the preferred credentials set for a database instance by the user that adds the database to AWRW. If you already heavily use preferred credentials and want to use a different preferred database login for AWRW extraction compared to your usual DBA activities, you may elect to create a dedicated EM12c administrator to maintain AWRW to avoid conflicts. The AWRW extraction user in the target database must have the DBA role and must also have an explicit execute grant on package SYS.DBMS_SWRF_INTERNAL. I have chosen to use the SYSTEM account, to match my other preferred credential usage, but a more secure setup would use an account dedicated to this task. Take a look at how much space AWR consumes in your SYSAUX tablespaces already. Your AWRW repository will need at least this much space, multiplied by however long you plan to keep these AWR snapshots around. This will get very large, very quickly. Added 20140912: I highly recommend that you disable data file autogrowth on your AWRW repository database. I experienced repeated hangs until I determined that my jobs continually got stuck when SYSTEM or SYSAUX nearly filled and they sat there waiting on data file operations I/O as the system failed to resize the data files or identify a deadlock. Do not rely on data file autogrowth, at least when using an 11.2.0.4 AWRW repository. 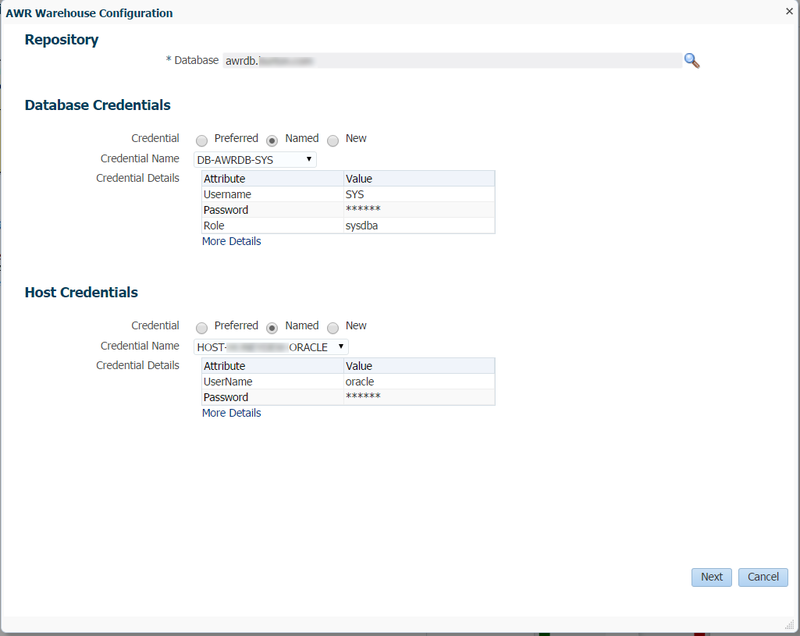 To begin configuring the AWR Warehouse, you must login using an EM12c super administrator account, like SYSMAN. Once logged in, go to the Databases target list screen. Unfortunately for this purpose you must use the “Database Load Map” form of the screen and not the infinitely more useful “Deprecated Search List (with Metrics)” that I have up on screen 99.9% of the time. Click the Targets menu, select Databases from the submenu that appears, and then if you do not see a “Performance” menu, enable the “Database Load Map” radio button. 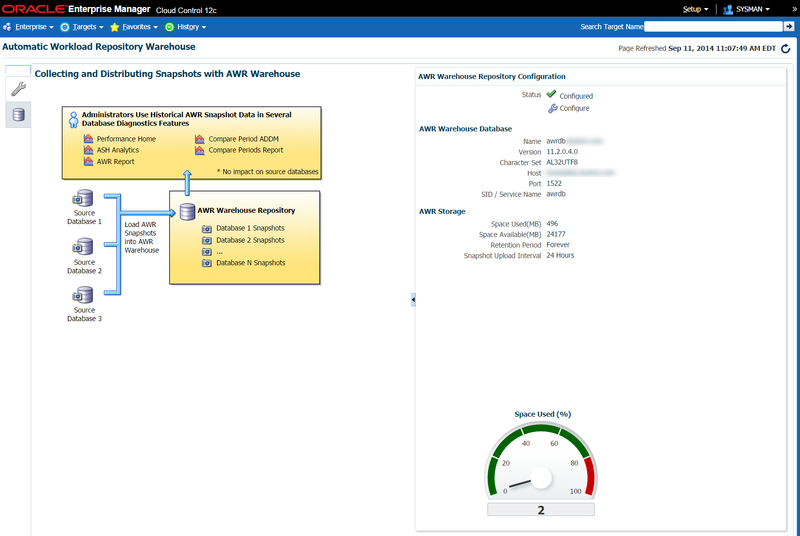 Click the Performance menu and select the “AWR Warehouse” item. At this point, if you used a super administrator account, you should see a summary screen that briefly describes the feature with a link to click to begin configuration. If you don’t, log out and come back with the SYSMAN account. The next screen offers a search box to select the database to use as your AWRW repository and the usual credential selector. Select the correct database, choose a database credential (I first selected SYSTEM, which failed, so use SYS as SYSDBA) and provide host credentials. Once you click Next, the tool will pop up a dialog box warning you to make sure that your repository database has the necessary patch installed, and then asks you to select how long the system should keep AWRW data. You can also select a staging location for AWR data extract storage prior to data loading. Click Submit on this screen and OEM will submit a job to initialize the AWRW repository. To find this job later, if needed, go to the advanced job activity page and search for jobs of type “dbSetupCAW”. The job should complete successfully if you have done everything correct so far. On my system it only took six seconds, so just wait a moment and then reload the page, which should now look like this. Click on the database icon at the upper left to switch away from the repository configuration tab to the database selection tab. As of this point you no longer need to use the SYSMAN account. I switched back to my regular account, then returned to this screen. Click the Add button to begin adding your first database(s). OEM will prompt you with the usual target selection screen. Choose one or more databases and then click the Select button. AWRW will NOT prompt you for credentials at this time. Instead it will silently use the database host and normal database user preferred credentials you have established for the database target. Another rough edge I expect to work better in future versions. AWRW will perform some initial validations of those credentials to make sure that the database user has the DBA role and the previously mentioned execute grant on SYS.DBMS_SWRF_INTERNAL. If you have missed any of these steps OEM will tell you about it and prevent you from adding the database. Again, later I expect this to include an automated setup that will fix those issues. At this point you can just walk away and within about 24 hours you should have AWR data loaded into the warehouse. If you feel impatient, click on one of the lines for a database to select it, then choose “Upload Snapshots Now” from the Actions menu. This will submit a job to extract and load the AWR data, which you can find later under the job type “Run AWR Extract, Transfer and Load”. In the background, this job extracts AWR data to the AGENT_INSTANCE_DIR on the target database’s server, compresses the data, transfers it to the staging area defined during AWRW repository setup, then loads the transferred data into the consolidated AWR Warehouse repository. One database in there. So many to go. The size of and load on your selected database, along with the amount of AWR history you keep online, will influence how long each load takes. My first load appeared to hang, with the AWRW repository database full of sessions waiting on enq: HW contention and buffer busy waits. I ended up doing a shutdown abort and following the workaround instructions in MOS note 1912230.1. I do not know if I truly needed to do this or not, but the symptoms sounded similar. I’ve also noticed that some limits appear to exist. I keep 42 days worth of hourly snapshots in each AWR, and my initial load only picked up 20 days / 500 snapshots. This may represent rate-limiting as a way to trickle-load the AWRW, or it may mean AWRW does not yet play nicely with large AWR data. Time will tell, and I fully expect future versions to shake out any bugs and to hold the DBA’s hand a bit more through the process. I hope to cover using AWRW for performance tuning in a later post and I look forward to comments. See these other fine posts for more information. This entry was posted in Cloud Control, Database and tagged AWR, oms, performance, repository on September 11, 2014 by Brian Pardy. In order to save power in our data center, I need to migrate my EM12c R3 environment from the host where it currently runs to a new host. I have a simple configuration, with a single OMS, no load balancer, and the repository database runs on the same host as EM12c R3 itself. I also have BI Publisher installed and integrated with EM12c, and a few third party plugins as I’ve detailed elsewhere on this blog. If you use an OS other than Linux x86-64 I suggest you research thoroughly as this procedure may or may not apply to your environment. Further, if you have a multi-OMS setup or use a load balancer, you must read the documentation and adapt the process accordingly to match your system’s needs. Note that I wrote this as I did the migration, live, on my production system, so I have text in a few places showing where I would have done things differently if I knew what to expect in the first place. It all ended up working, but it could have been simpler. 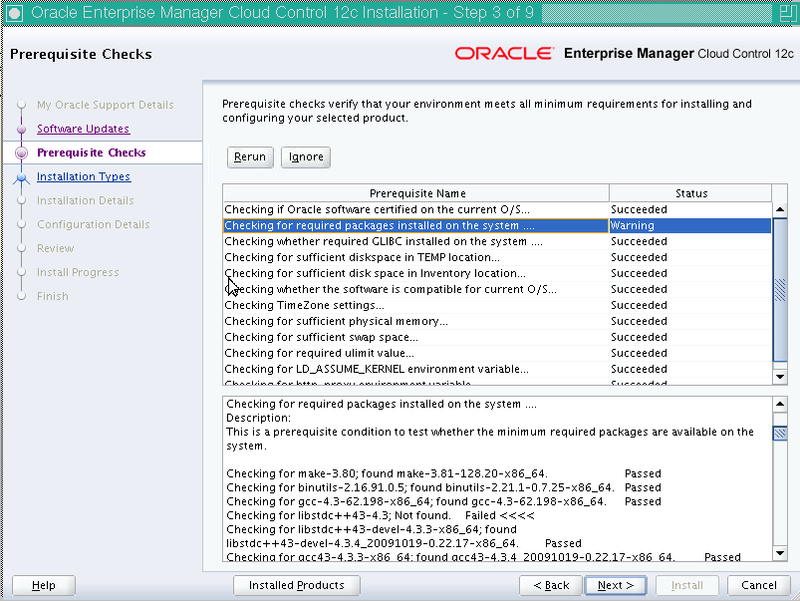 Oracle documents the procedure for this migration in the EM12c Administrator’s Guide, Part VII, section 29, “Backing Up and Recovering Enterprise Manager“. 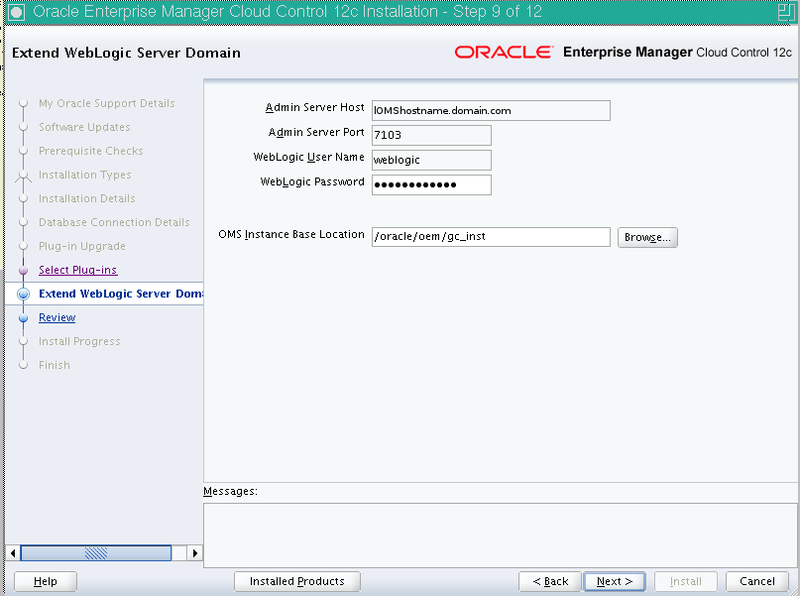 As a first step, my system administrator installed SLES 11 SP3 on the new server and created an account for me along with the ‘oracle’ account for EM12c. I have a 70GB volume to use for the database and OEM binaries, a 1GB volume for the DB control files and a 2GB volume for redo logs supplemented with a 15GB FRA volume to support flashback. Due to our tape backup strategy I use the FRA only for flashback, which we don’t wish to backup, and use a separate volume for RMAN backupsets. To avoid a backup/restore cycle, the volumes holding the database datafiles will just be moved over to the new host on the storage side. First I will relocate the management repository database to the new host, then complete the process by relocating the OMS. I run Oracle Database 11.2.0.3, Enterprise Edition, plus PSU Jul 2013. Rather than installing the database software from scratch and patching it, I will clone the existing Oracle home to the new server. 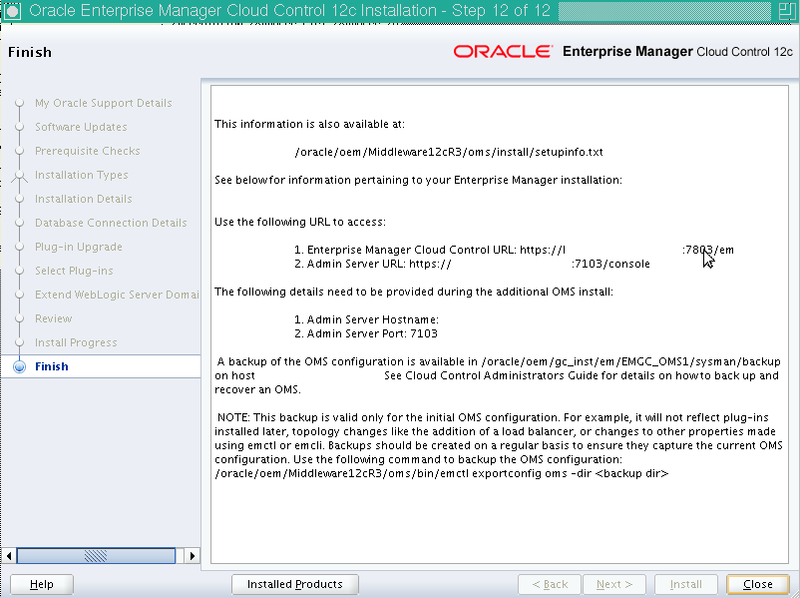 Unfortunately I cannot use EM12c to do the cloning, as cloning via EM12c requires a management agent on the new host. 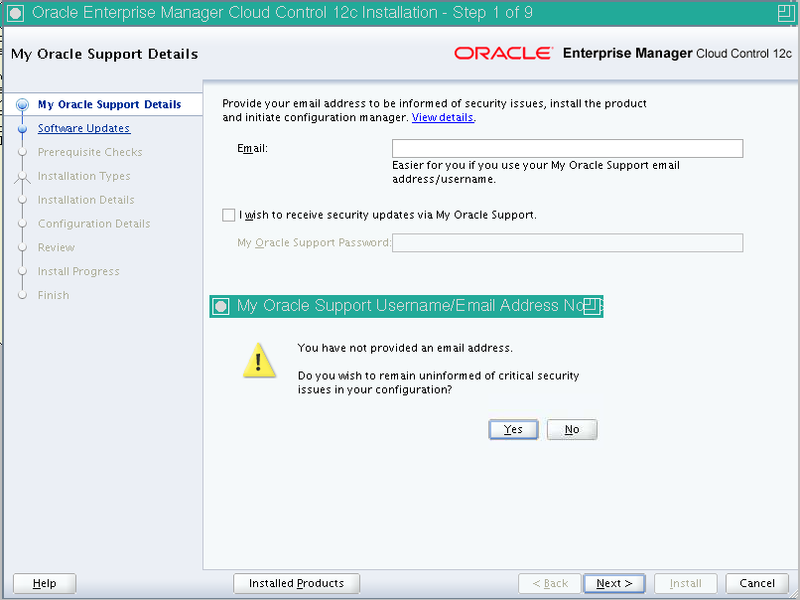 The software-only install of EM12c that I will run later installs a management agent as part of the process and I do not wish these two to conflict, so I do not want to install an agent on the new host at this time. I will clone the database home according to the procedure in Appendix B of the 11gR2 database documentation. You should review the documentation for full details. Stop the OMS, database and management agent before cloning the existing Oracle home. Create a zip file of the existing database home. Run this step as root (or using sudo) to make sure that you get all the files. Now I will start the original database back up so that OEM continues running while I prepare the cloned Oracle home. I will perform this migration over a few days, as I have time, so I need to keep OEM up and running as much as possible to support and manage my other databases. Copy this zip file to the new host. On the new host, extract this zip file to the target directory. Remove all “*.ora” files from the extracted $ORACLE_HOME/network/admin directory. 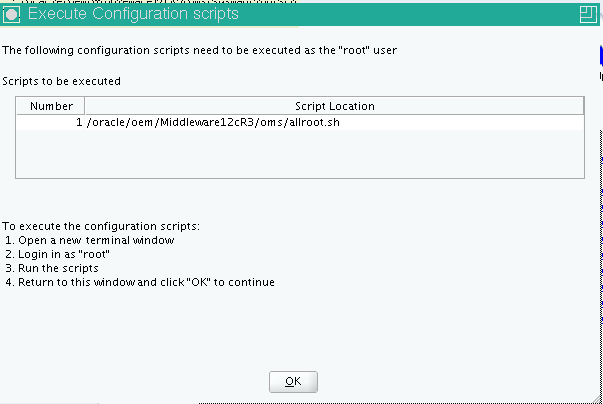 Unfortunately this creates an oraInventory directory in the oracle user’s home directory. I prefer to keep oraInventory under ORACLE_BASE, so I moved it and edited the generated files to change the path from /home/oracle/oraInventory to /oracle/oem/oraInventory. Most likely some environment variable, or a previously existing /etc/oraInst.loc would have prevented this optional step. Complete the cloning steps by running the orainstRoot.sh and root.sh scripts. Changing groupname of /oracle/oem/oraInventory to dba. I do not want to use netca to configure the listener, so I will just copy the $ORACLE_HOME/network/admin/*.ora files back over from the original server to the new server, and edit them accordingly. This completes the database cloning. At this point you will probably use RMAN to create a backup of your original repository database, then restore that backup onto the new host. Instead, I will cheat a bit, shut down OEM and the database, and ask my sysadmin to move the repository database’s datafile LUN over to the new host and mount it at the same location. Before moving the LUN, create directories that the database needs for a successful startup. These include the admin/SID/adump directory, and in my case, the /oracle/mirror/SID/cntrl and /oracle/mirror/SID/log directories where I keep the multiplexed copies of my redo logs and controlfiles. As a sanity check, you should try starting up the listener on the new server and starting the database in NOMOUNT mode before proceeding. This will help catch any issues that may exist in your environment before you start the outage on your original server. Investigate and resolve any issues found before proceeding. Shutdown the OMS, agent and database on the original server. Copy the controlfiles and redo logs from the original server to the new server. Back on the new server, start up the listener, then the database. I probably should have disabled flashback first. Start the OMS and agent on the original server. OMS startup will fail, as you have not yet reconfigured the repository. Failed to connect to repository database. OMS will be automatically restarted once it identifies that database and listener are up. Reconfigure the OMS repository database connection. Provide SYSMAN’s password when prompted. And finally, restart all the OMSs using 'emctl stop oms -all' and 'emctl start oms'. Stop, then restart the OMS. Login to OEM and confirm proper operation of the system. I had a lot of alerts for failed backup jobs since my repository database hosts my RMAN catalog. These can wait for now. Also expect your repository target to show as down, since you have not yet updated the monitoring configuration. Reconfigure it now, providing the SYSMAN password when prompted. oracle$ $OMS_HOME/bin/emctl config emrep -conn_desc "(DESCRIPTION=(ADDRESS_LIST=(ADDRESS=(PROTOCOL=TCP)(HOST=newhost)(PORT=1521)))(CONNECT_DATA=(SID=emrep)))"
At this point you have successfully moved your repository database. Don’t worry about any errors for now, though if you rely on an RMAN catalog and stored scripts for your backups, and these all live in your OEM repository database, you should go through now and update the monitoring configuration for the repository database and listener so that backups of your other databases do not fail. I had to edit the recovery catalog and specify the host, port, and SID manually, since for some reason when I told it to use the repository database it kept trying to use the old hostname. I will fix this after I complete the rest of the migration. IMPORTANT NOTE: Since you have not yet migrated the repository database target to an agent local to that machine, backups of your repository database may not run. Monitor your archived log directory on this system until you complete the rest of the migration, and manually run backups when necessary. 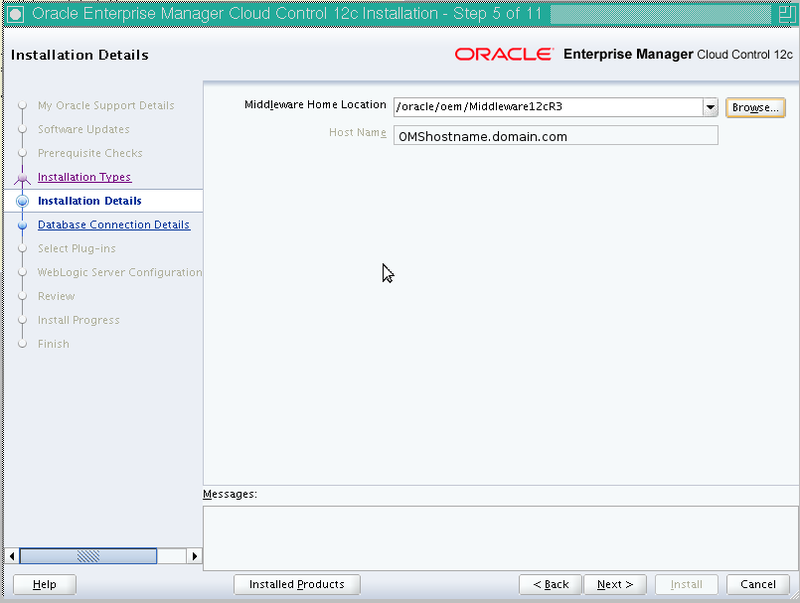 To install the OMS on a new host, perform a software-only installation from the same EM12c R3 installer that was used to install on the original host. You will need to identify and retrieve all of the plugins that you have installed on the current OMS, as well as any patches that are currently installed on the OMS. You must also make sure to use the same directory layout as on the original OMS. 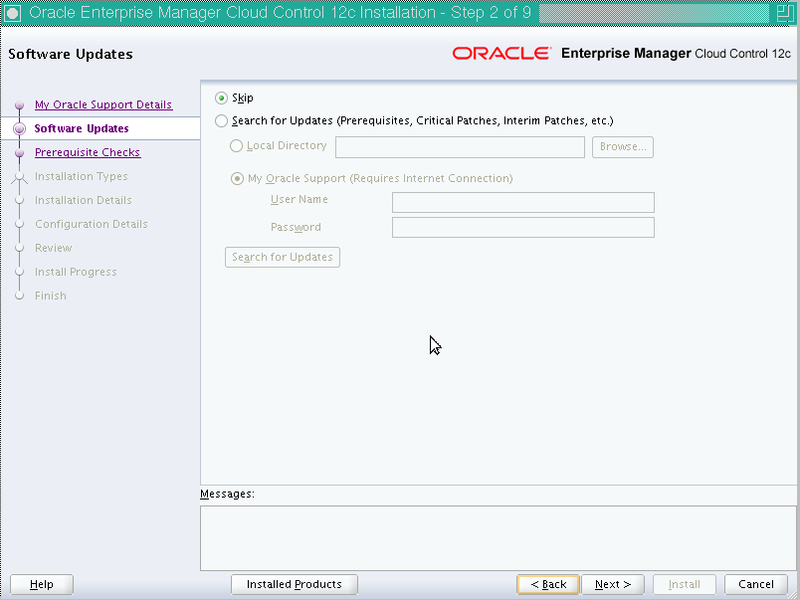 This patch gets installed by the EM12c R3 installer, so no need to bother with it any further. If you have other patches installed, go fetch them, and install them after you have completed the plugin installation (see below). Identify all plugins installed on your system using the query provided in the documentation, run as SYSMAN against your repository database. Oracle-provided plugins will show a URL from which you must download the plugin. Third-party plugins will not; you will need to make sure you have the appropriate downloaded plugin install .opar file from when you initially installed it. Gather up all of these plugin files into a single directory on your NEW OMS host, changing the “.zip” filename extension to “.opar” for the Oracle-provided plugins. You need EVERY plugin returned by this query or else your installation will NOT work. I placed mine in /oracle/oem/migration/plugins. You also need to copy over the three .zip files containing the OEM 12cR3 distribution: V38641-01.zip, V38642-01.zip and V38643-01.zip. Save them into a convenient staging area on the new server (I use /oracle/oem/stage). Go to the staging area on the new server and extract the three .zip files containing the EM12c R3 distribution, then start the installer. 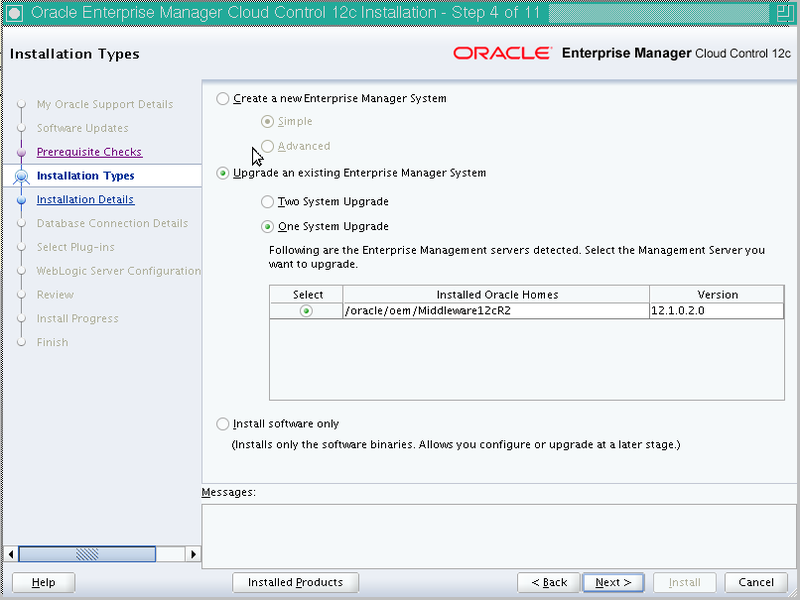 You can follow my previous post about upgrading EM12c R2 to R3 for more information about the installation process, just make sure you run it as a software only install and use the exact same path names as configured on the original OMS. In my case this means a middleware home of /oracle/oem/Middleware12cR3 and an agent base directory of /oracle/oem/agent12c. While the software installation proceeds, you should run an exportconfig on your current OMS to produce the configuration backup file you will need to use to reconfigure the new one. Enter the SYSMAN password when prompted. Copy that backup file to the new server. Once the software-only install finishes, it will prompt you to run allroot.sh. Do so. After running allroot.sh, you need to run the PluginInstall.sh script with the path where you saved the .opar files. Make sure you select every plugin listed when you ran the query to retrieve the plugin list earlier, then hit install. Go to the original server, and copy the contents of the software library to the new server. Shut everything down on your old server. Run OMSCA using the exportconfig backup file you generated earlier. Enter the administration server, node manager, repository database user and agent registration passwords when prompted. Copyright (c) 1996, 2013, Oracle. All rights reserved. Admin Server recovered from backup. Infrastructure setup of EM completed successfully. Pre deployment of EM completed successfully. Deployment of EM completed successfully. Post "Deploy and Repos Setup" operations completed successfully. Total 0 errors, 78 warnings. 0 entities imported. No logging has been configured and default agent logging support is unavailable. Post deploy operations completed successfully. Start the OMS on the new server. Configure the central agent on the new server, then run the root.sh script. 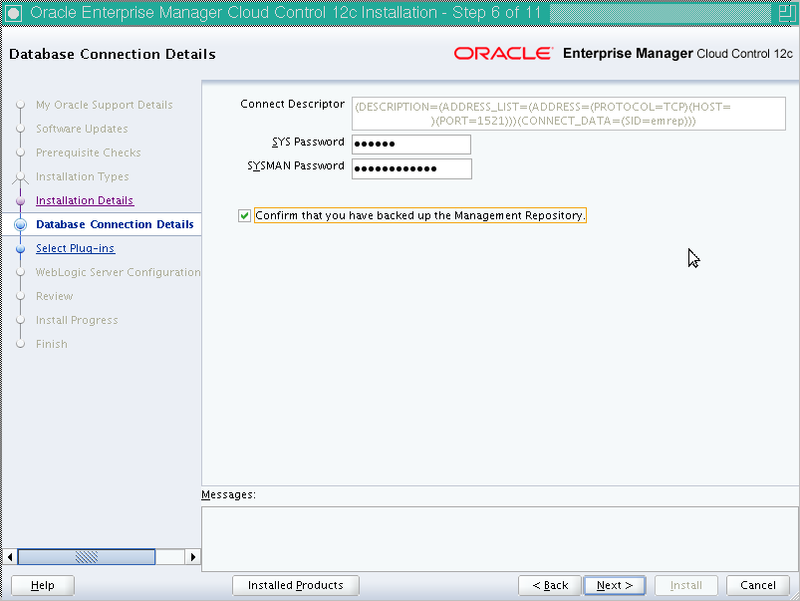 Relocate the oracle_emrep target to the new OMS host. 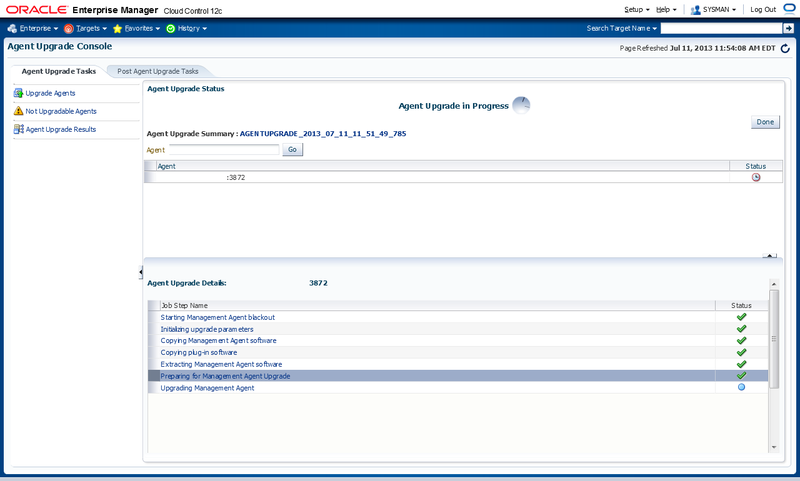 Step through each of your existing agents to re-secure them against the new OMS. Provide the OMS HTTP port (not HTTPS) in this command, and enter the agent registration password when prompted. $ $AGENT_INSTANCE_DIR/bin/emctl secure agent -emdWalletSrcUrl "http://newhost:4890/em"
Start the agent on the old OMS server. You should not need to do this, but I could not update the WebLogic Domain monitoring configuration without doing so first. Also re-secure this agent to point to the new OMS. oracle$ $AGENT_INSTANCE_DIR/bin/emctl secure agent -emdWalletSrcUrl "http://newhost:4890/em"
Login to the OEM GUI running on the new server and navigate to the WebLogic Domain target for the Cloud Control domain. In the Target Setup -> Monitoring Credentials section, update the Administration server host value to the new server name, then hit OK. Then execute a Refresh WebLogic Domain, selecting Add/Update Targets, to move all WebLogic targets to the new central agent. I use third-party plugins to monitor VMWare targets, NetApp storage and MySQL servers. I had many of them set up to run from the OMS agent (except for the VMWare ones, since Blue Medora helpfully advised not to use the OMS agent for this — great advice). I now need to relocate each of these targets to the new central agent using emcli. You won’t need to do this step unless you also have things set up this way. If I had to do this again, I would not use the OMS agent for these targets, since I would not need to change anything if I just had these on some other agent. 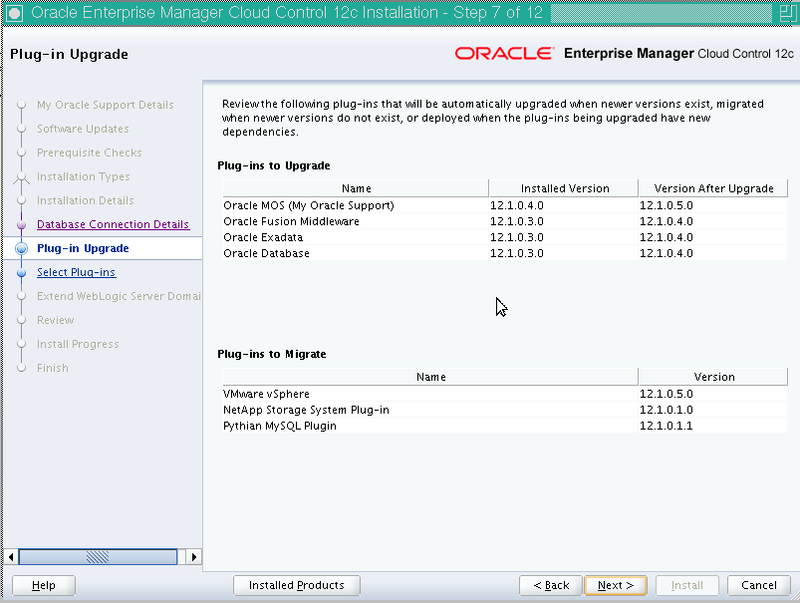 By now you have completed the bulk of the work necessary to migrate your EM12c stack to a new server. Only a few steps remain. If you use any utility scripts on the old server, go ahead and copy those over now. I have scripts to automate starting/stopping the OMS and agent, so I’ve copied those over. Also make sure the oracle user on the new server has all the environment variables set up in their shell initialization files. The GCDomain Oracle WebLogic Domain target did not get moved to my new agent. If this happened to you, go to the target home page and select the Modify Agents menu item. 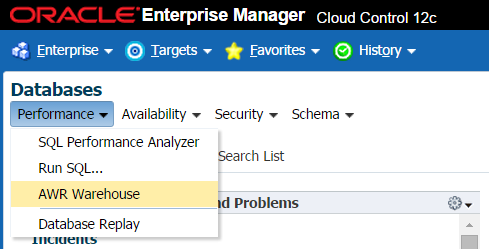 Click Continue, then find GCDomain in the list, scroll to the right, and assign the new OMS server’s agent as the monitoring agent for this target, then click the Modify Agents button. Since I had BI Publisher installed on the old server, I need to install it again on the new one. Retrieve the 11.1.1.6.0 BI Publisher installation files used previously, and copy them to your staging area. Run the “runInstaller” program from bishiphome/Disk1, and perform a software-only installation with the middleware home set to your EM12c installation middleware home, and leave the Oracle home as Oracle_BI1. Instead of running the configureBIP script as you normally would to integrate BI Publisher with EM12c, just go to the WebLogic administration console after the software-only install completes, and navigate to the BIP server configuration page. Lock the configuration for editing, and edit the configuration to change the listen address to reference the new server’s hostname and change the machine to the machine name where the admin server runs (in my case it showed up as EMGC_MACHINE2). Save and activate the changes, then start the BIP server. After the server has started, return to the WebLogic Domain page and re-run the Refresh WebLogic Domain step, again with Add/Update targets, to move BIP to your new OMS agent. I actually had to do the Refresh WebLogic Domain step here twice. I may have simply not waited long enough after starting BIP before I ran it, but I do not know for sure. I have only one target showing down at this point, the EM Console Service. Go to the target, and click on the Monitoring Configuration tab. Click on Service Tests and Beacons. Select the EM Console Service Test, and click the Edit button. Make sure you have the “Access Login page” step selected, and click Edit. Change the URL to reflect your new OEM server, and save the changes. Stop the agent on your original OMS server. 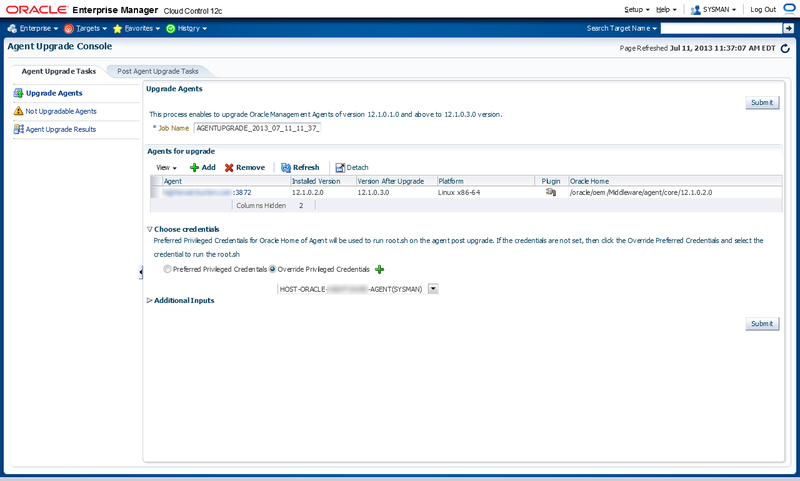 Remove the host target where your original OMS ran. Then remove the agent target. Finally, bounce the whole thing one last time, then start it back up. All green. I would prefer a simpler process to migrate the EM12c stack to a new server, but this works. If you find yourself in a similar position to mine, I hope this helps you. I’ve spent a lot of time working in EM12c so I feel capable to diagnose and resolve issues encountered during the process, but if you run into problems do not hesitate to contact Oracle Support and file a service requests. If you want your system to stay supportable, stick with the experts and just use blogs as a guide to get started. Good luck. This entry was posted in Cloud Control and tagged oms, repository on August 28, 2013 by Brian Pardy. This post covers my production upgrade from EM12c R2 to EM12c R3 on Linux x86-64 (SLES11 SP2). To stress test the upgrade and keep it interesting, this system also has BI Publisher integrated into OEM, and also has the plugin from NetApp (version 12.1.0.1.0), the VMware plugin from BlueMedora (version 12.1.0.5.0), and the MySQL plugin from Pythian (version 12.1.0.1.1). The repository database is running on version 11.2.0.3. Due to some issues I had with the upgrade from EM12c R1 to R2, I highly recommend that you do NOT use Cygwin to ssh to your OMS host and display the installer over ssh using Cygwin’s X server. Use VNC instead. I’m not going to try Cygwin this time through. First, I start vncserver on the OMS host. Then I connect to it to using TightVNC from my desktop machine. Overall, the upgrade installation steps took 1 hour and 15 minutes in my environment. This was on a physical server with 126GB RAM, 16 dual core processors and 200 managed targets. This does not include the post-upgrade steps shown below. Now that the upgrade is complete, return to the upgrade guide to complete post upgrade steps. Your environment may differ from mine, but these are the steps I had to follow. At this point my EM12cR3 production upgrade is complete! Everything I have checked so far appears fully functional. The only problem I had was a small filesystem for the management agent on my sandbox server causing the agent upgrade to run out of space, forcing manual intervention to resolve. Don’t be stingy with space like I am and you should be fine. I haven’t taken any time to investigate the new features yet, but I will be now. This entry was posted in Cloud Control and tagged oms, repository, upgrade on July 12, 2013 by Brian Pardy. Update 13 Nov 2012: Patch 14726136 has been obsoleted. The note on MOS indicated that the patch caused some metrics to be calculated incorrectly. The patch has been replaced by patch 14833587. I have applied the new patch and all appears well — jobs are running and redo generation on the repository database remains where it was before the upgrade to EM12c R2. Following up again on the EM12cR2 upgrade issue from BP1 that causes significantly increased redo logging on the repository database due to heavy insert activity in EM_JOB_METRICS. I first covered this here, with a followup here, a partial workaround here, and then a warning here. Patch 14726136 has been re-released on MOS. The initial release caused problems for me as it prevented all OEM scheduled jobs from running, eventually causing me to rollback the patch. I am very pleased to report that the new update of the patch (from Oct 30th) applies cleanly and all of my jobs are now running on-schedule and completing successfully. EM_JOB_METRICS is showing no more than 11 inserts per second, and more than a minute is passing between the batches of inserts. My redo volume is already down significantly. 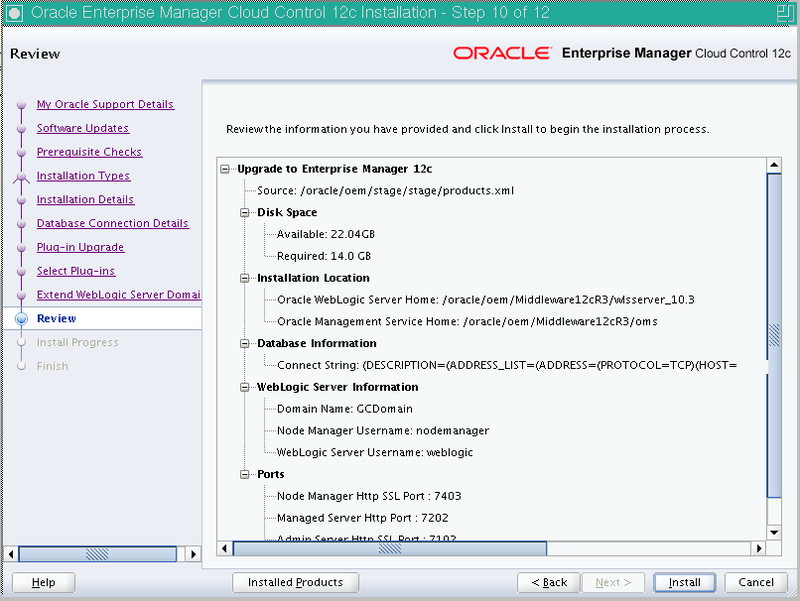 Big thanks to Oracle support and development and the EM12c team! This entry was posted in Cloud Control and tagged bug, oms, patch, redo, repository, upgrade on October 30, 2012 by Brian Pardy. You may have seen the patch in the title drop regarding increased redo logging after upgrading to EM12cR2. I tried the patch Friday morning, and while it did decrease my redo logging, it also prevented any OEM scheduled jobs from running. I eventually rolled back the patch and jobs ran again. I would be very interested to know if the patch works for you AND your jobs still run. This entry was posted in Cloud Control and tagged bug, oms, patch, redo, repository, upgrade on October 28, 2012 by Brian Pardy. Another followup to my previous posts on increased redo logging on the repository database after upgrading to EM12cR2. By making this change, followed by a bounce of the OMS, the redo generation on my repository database decreased by about 50%. It’s still 200-300% more than before the upgrade, but it’s quite an improvement. The EM_JOB_METRICS table now only receives about 20 inserts per second compared to 60. My 13GB repository database should now only produce about 5GB of redo per day instead of 10GB. Prior to the change, emctl get property reported these property values as null so presumably the OMS was working with whatever the built-in default values were. In my case, a delay between job steps is a tradeoff that I can tolerate. This OMS runs simple database backups, SQL and RMAN scripts, so I do not have any time-critical multi-step jobs that could be negatively impacted by delayed response to completion of individual job steps. Your mileage may vary. Oracle Support is continuing to investigate this bug. At least one other poster on the forum has reported that they too are experiencing this issue so I’m looking forward to finding out if this change reduces their redo generation to an acceptable rate. That same poster also reports that they do not see the issue on a new install of EM12cR2, only on a system upgraded from R1. It’s not clear to me why an upgraded system would experience this when processing the raw metric data while a fresh install would not, nor is it clear how many upgraded systems are experiencing the issue. But at least we now have a partial workaround for bug 14726136. This entry was posted in Cloud Control and tagged bug, oms, redo, repository, upgrade on October 12, 2012 by Brian Pardy.